In all honesty, midge-fishing is only as difficult as you make it! Many anglers shy away from fishing with tiny flies and spider web thin tippets, but trust me–that is a huge oversight! The most challenging part of midge-fishing is tying on the minuscule offering that is oftentimes required to catch trout during the winter. Recently, I caught a beautiful rainbow on the Farmington River, a tailwater in northwestern Connecticut, with a size 28 adult midge on 7X tippet. That experience was about as rewarding as they get! Thank goodness for a fly box with a threader, otherwise; I might still be standing in the river trying to tie that tiny midge imitation on. The small fly game is simple but effective! None of these will win a fly tying contest, but they do fool selective, hard-fished, tailwater trout throughout the winter months. 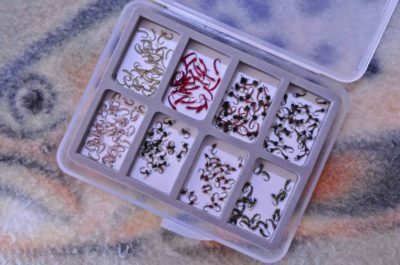 Savvy anglers show up to the river with a thorough assortment of midges in sizes 20-26. It’s important to note, what midges lack in size, they make up in numbers. Midges produce 3 to 5 broods per calendar year, which punctuates the importance of continuously imitating the various stages of their lifecycle (larvae, pupae, and adults). Some of my favorite midge larvae and pupae include: Pale Olive Larvae, Red Larvae, Mercury Blood Midges, Mercury Black Beauties, Mercury Midges, Manhattan Midges (black and red), Top Secret Midges, and Minute Midges. Other favorites include (not pictured above): Bling Midges, Zebra Midges, Jujubee Midges, South Platte Brassies, Miracle Nymphs, San Juan Emergers, Medallion Midges, and the Neon Nightmare. As far as the adults are concerned, it’s hard to go wrong with a Matt’s Midge, Griffith Gnat, or Parachute Adams. 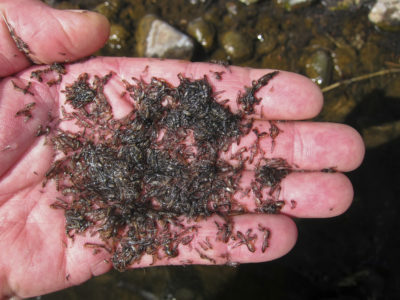 In some watersheds, midges make up as much as 50% of a trout’s diet. What they lack in size, they make up with their huge populations that emerge day in and day out. This time of year, it’s never a bad idea to fish with a egg-midge combo. A micro egg (size 18, tied from McFlyfoam) is the perfect attractor trailed by two midge imitations. I typically run a larva as my second fly, then trail a pupa below it. Make sure you check your local regulations with regard to the number of flies you can legally fish in a tandem rig. In some states like New Mexico and Montana, you can only use two flies, but in Colorado, you can fish with 3 flies. I find the 3rd fly increases your odds exponentially. Mid-column midge-fishing requires a lot of finesse and skill to master. I recommend using a yarn strike indicator and a number 6 split shot in your nymphing rig. It’s important that you do not use too much weight, otherwise; your offerings are presented below the fish, instead of mid-column, where you’ll find the majority of fish keying on pupae. I make small adjustments with JP’s Nymphing mud and move the indicator up and down the leader to achieve the proper depth. Observation is important when trying to determine which part of the water column the trout are feeding in. 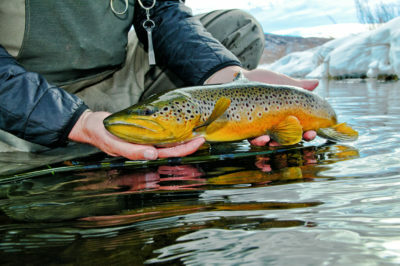 Trout overwinter in the slow, deep pools. Avoid fast riffles and runs and these areas tend to be void of fish between November and March. It’s important to target the soft water margins, concentrating your efforts in the slower pools and tailouts during the winter. 6 and 7X tippets and long leaders are mandatory for success. Only a keen eye detects the subtle strikes this time of year. If the indicator slows down, twitches, twists or turns, set the hook, as this is a good indication a trout has taken your fly. Make sure you set the hook downstream, back into the trout’s jaw with a firm stroke, but short range of motion. Wide-gap hooks like a Tiemco 2488 help with your hook-up to landing ratios. The good news is that anglers willing to battle the elements typically a few cooperative fish on just about any winter outting. Sometime just getting out is half the battle, catching a fish or two is a bonus! If you can consistently catch a handful of fish during the winter, the rest of the year seems a little bit easier.